This is the Oakland Makerspace General Meeting. Folks who are interested in leadership and core projects like fundraising, education development, community outreach and development and youth work should attend. Contact us in advance if you are joining on skype or conference call so we can loop you in. Please RSVP by Monday at 3pm. We’re developing a supportive space for meditation and community building under a radical framework. we want to merge our spiritual and political practice so that in their increased alignment we can be ever more creative and strategic in how we approach smashing capitalism and building liberation. This sangha is donation based. Proceeds go to the organizers for supplies and to hold oakland makerspace. We are looking for cushions to support our meditation. Please spread the word! 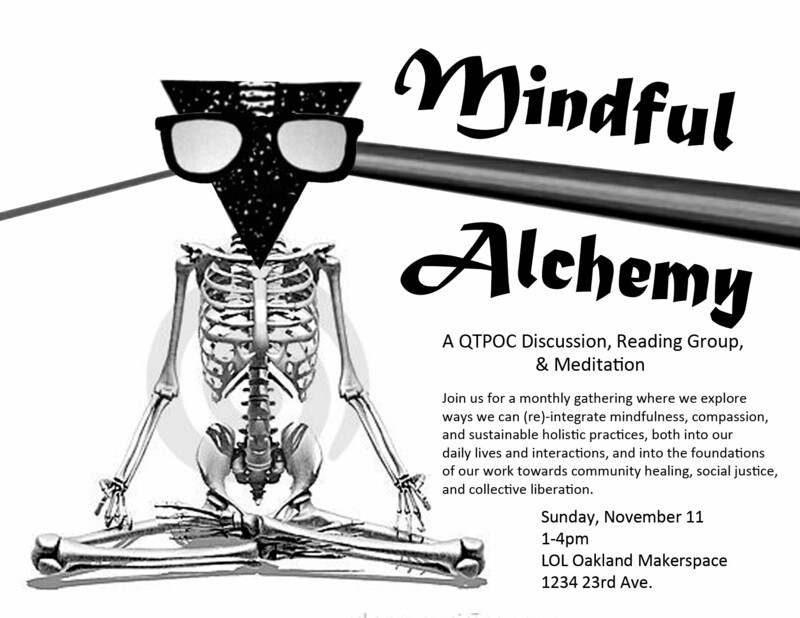 Join us for the first of a monthly gathering where we explore ways we can (re)-integrate mindfulness, compassion, and sustainable holistics practices, both into our daily lives and interactions, and into the foundations of our work towards transformative community healing, social justice, and collective liberation. Some influences include: the Dalai Lama, Thich Nhat Hanh, Chogyam Trungpa Rinpoche, Pema Chodron, Vandana Shiva, bell hooks, Gloria Anzaldua, Chinese medicine, “permaculture”, Food Justice, the Black Panthers, Community Health, Queer Magic, Ancestry, Storytelling, and You! There will be a 30 minute meditation at the start and the close of the gathering. Scent-free. Bring snacks to share! Free, donations encouraged to help sustain oakland makerspace! Bring a mat, towel, and water! What is Hatha Flow Yoga? Traditional hatha yoga is a holistic yogic path, including disciplines, postures (asana), purification procedures, breathing (pranayama), and meditation. It is also recognized as a stress-reducing practice. Hatha yoga attempts to balance mind and body via physical postures or “asanas”, purification practices, controlled breathing, and the calming of the mind through relaxation and meditation. Asanas teach poise, balance and strength and are practiced to improve the body’s physical health and clear the mind in preparation for meditation. FLOW ( Vinyasa) Vinyasa, meaning ‘breath synchronized movement’ is a series of poses that you move through on either an exhale or an inhale. Eating healthier is easier with friends! 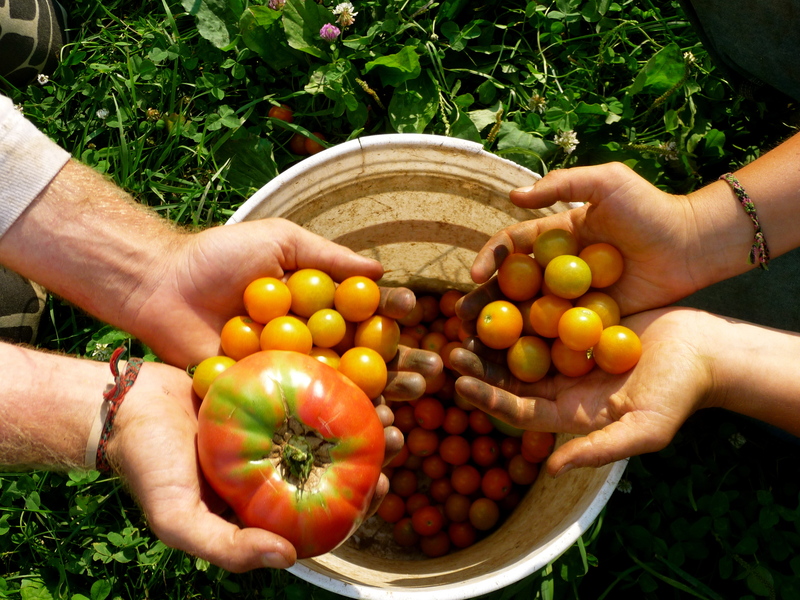 Trade recipes, get nutrition tips and learn how to cook with simple whole foods. We will discuss what foods are available seasonally and talk about healthy meal planning for your busy week. To get your favorite recipe on a card for trading send to flynn.may@gmail.com by 11/24.